Bit Tooth Energy: Iceland volcanoes and when can I travel? Iceland volcanoes and when can I travel? Yikes! 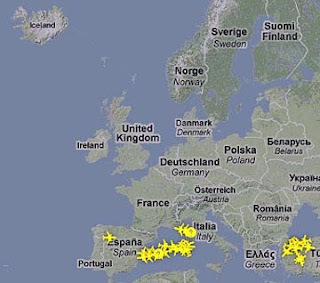 Flightradar has taken out their inclusion of the airports in the overall picture, and the emptiness of the European skies becomes even more apparent. And so the next question comes as to how long will this last? And unfortunately the news there is not particularly encouraging. Even short flights through light ash from this eruption have already been shown to damage aircraft and so authorities are rightly going to be very conservative on what they allow. The backlog on passengers already caught in the cancellations are now up to more than a week. Honeymooners Paul and Tracy Sheehan, of Kent, England, were among those trapped by the ashy atmosphere. The couple arrived to catch a transfer flight on Friday night - only to hear the next available American Airlines flight home was one week away. The hope that the volcano would have settled down enough to allow a scientific flight over the plume has been premature, and the flight was cancelled as the eruption continues. The initial measure for Eyjafjallajokull was at a scale of 1, but it hasn’t been possible to assess where it is now fitting. In contrast, as I noted Thursday when Katla last went it was at a scale of 5, and the Mount Pinatubo eruption in 1991 was a 6. However Pinatubo was a single event eruption, ejecting some 15 – 30 million tons of sulfur dioxide, along with 5.5 cubic km of other material in a nine hour period on June 15th. The consequences lasted much longer. The eruption plume of Mount Pinatubo's various gases and ash reached high into the atmosphere within two hours of the eruption, attaining an altitude of 34 km (21 miles) high and over 400 km (250 miles) wide. This eruption was the largest disturbance of the stratosphere since the eruption of Krakatau in 1883 (but ten times larger than Mount St. Helens in 1980). The aerosol cloud spread around the earth in two weeks and covered the planet within a year. During 1992 and 1993, the Ozone hole over Antarctica reached an unprecedented size. The cloud over the earth reduced global temperatures. In 1992 and 1993, the average temperature in the Northern Hemisphere was reduced 0.5 to 0.6°C and the entire planet was cooled 0.4 to 0.5°C. The maximum reduction in global temperature occurred in August 1992 with a reduction of 0.73°C. The eruption is believed to have influenced such events as 1993 floods along the Mississippi river and the drought in the Sahel region of Africa. The United States experienced its third coldest and third wettest summer in 77 years during 1992. 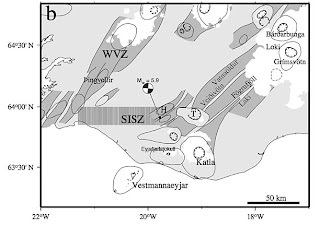 Icelandic volcanoes are generally less immediately intense, spread over a longer fissure, and last much longer. 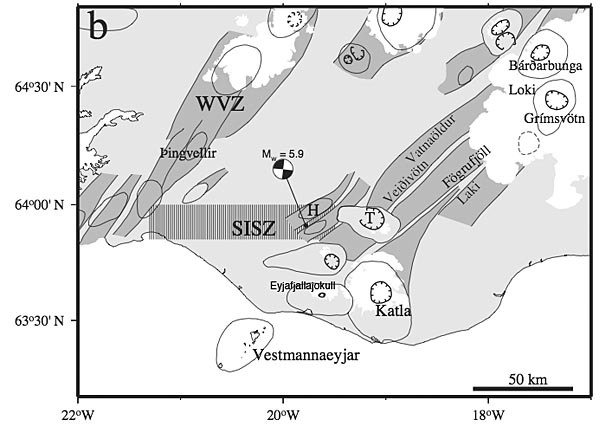 The Eastern Volcanic Zone (EVZ) shown above is thought to now be more dominant than the Western one, which has been relatively inactive, and it is here that the current crop of potential eruptive sources sit and that are being worried over. 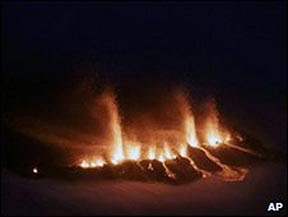 (Hekla for example has erupted in 1970 (VEI 3); 1980 (VEI 3); 1981 (VEI 2); 1991 (VEI 3); and 2000 (VEI 3). So, given that the last Eyjafjallajokull eruption lasted over a year, and the length of time since the last Katla eruption, and the movement of the plates being relatively consistent, there is not a lot of room for optimism. It may not be an immediate follow-on in the human scale of time, but in geological terms a year later is almost such, so it may well be that the powers in Europe, and around the world, may have to rethink how folks can be moved, if air travel is going to be more of a hit and miss event for a couple of years. So will I get to Europe next week?